For each flight, there is a shuttle service (HAVAS) from the airport to the city center. Please get off the bus at Alaaddin stop (Alaaddin Hill). 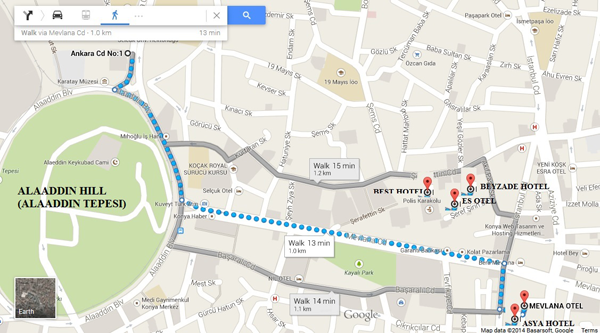 Then, it is a short distance from the stop to the hotels to walk (about 1 km). Please look at the map below to see the route. Looking forward to seeing you in Konya. Also, there will be a free bus transportation of Necmettin Erbakan University from the hotels to the conference venue at 8 am for May 16th, 17th and 18th.